Obby is a platform to support independent teachers building a teaching business. Our marketplace helps provide you with a platform for students to find you and your classes, courses or lessons. Our software tools help you engage and retain customers, as well as manage your business by providing value-added services such a booking management tools and venue space rental. So of course we think Obby is the bees-knees and the best place for you as a teacher to attract students to your classes. If you are not already part of the Obby community, you can apply to join here. If that’s not for you, that’s also fine - hopefully the rest of this guide can be of help anyways! Prospective students really want to read about what they will be learning. It is your job as the teacher to help them on that journey. Take the time to write a well-crafted class listing - you only have to do it once, and it will help loads! What will students be learning about? If it is a longer course, or the class is split into several parts, tell the full story - customers want to know! What level can students expect to get to? The best classes help students reach a sense of accomplishment, the worst just show someone how to make something without any real learning. Setting clear expectations is key. Share what makes your class special and don’t be afraid to big yourself up! The most popular days for classes (and recurring courses) are Saturdays, Sundays, and Tuesdays (after work / evenings)! Protip: Think of offering Anytime Classes. Over 20% of Obby bookings use our Anytime feature, which allows customers to book your class at anytime that suits both of you, instead of you having to pre-define dates. Several Obby hosts have built their entire business around this feature! Obby’s algorithm factors your schedule and availability into its rankings, so make sure you are keeping your calendar up to date at all times. To find out more about Anytime, get in touch here. These two aspects of your classes are correlated. We recommend new Obby teachers start off with slightly lower prices, and gradually work your way up. This will make it easier for you to get initial students, show off your fantastic skills, and let the reviews speak for themselves. For every few reviews (let’s say 3-5, it’s not an exact science, more recommended guidelines), you can increase your prices by a few percentage points. Protip: Don’t go overboard. If you suddenly find yourself as the most expensive option in the market, you might have gone too far! Another important note on pricing is that customers love to know what is included, and don’t like being charged extra on the day. Be transparent and include the cost of certain things in the pricing. Not including everything in the price upfront, and asking customers to pay additional on the day, leads to negative reviews every time! Your friends and family already know you, and will be keen to help you in your entrepreneurial ventures! This also makes them most likely to help you spread the word. 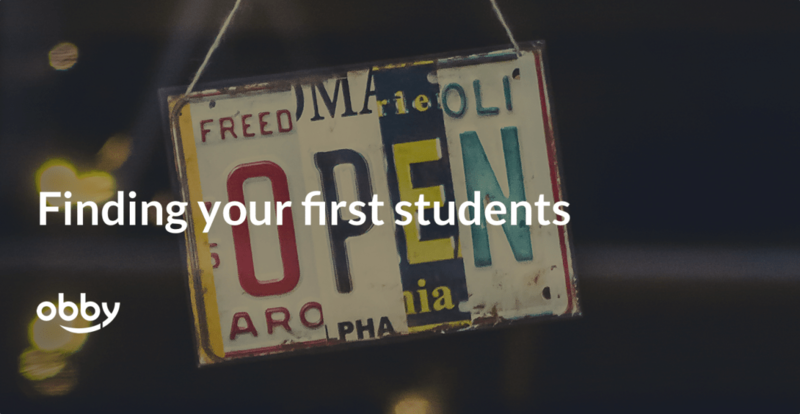 Tell them about your teaching plans and share your listings with them. Share what makes your classes unique so they have something to boast about! Social media isn’t what it once was. It is increasingly difficult to attract an audience on Facebook, Instagram, or Twitter, without paying for it. Therefore, we don’t advise you to spend too much of your efforts trying to build up a large following from scratch, although we do advise having some of your best content on there, easily accessible, so prospective students can find out a bit more about you and know what to expect. We like to think of it as a complementary tool which is important to have to build your brand and set customer expectations, but don’t advise relying on it as your primary customer acquisition channel. This is an underrated strategy that we highly recommend! Find closely aligned community groups (e.g. Facebook local community groups) and share your classes and profile with them. The members may not know you, but it is likely they emphasize with your journey and will be keen to help out - particularly if there is a local or topic relation! Contribute to Obby’s guides, blog, or other content. This will increase your visibility and help you attract more customers. If you are already an Obby partner, you can find out more about it on your dashboard, if you are not yet an Obby partner, you can apply to join here. Classes up and running, customers have booked on, now what? Read part 3 of our guide - Your first class: Creating the perfect in-class experience.